At Vanishing Point, Rip Hunter as a boy learns from his father Booster Gold the effects of time travel on the fifty-two universes. Booster then tells him that when he gets older he will protect and defend the time stream. One day, Rip will turn a goofy, self-centered man into the guardian of all things chronal. Now, the adult Rip, along with Booster, Green Lantern and Superman are about to confront Eobard Thawne, better known as Professor Zoom - the Reverse-Flash. 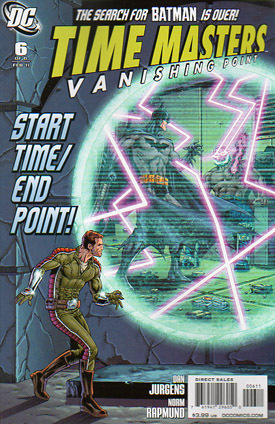 It's possible the villain intends to prevent the Time Masters from finding Bruce Wayne. Professor Zoom, like the Time Masters, has been following the Omega Energy that Darkseid had fired at Batman during Final Crisis. It is this that has caused Bruce Wayne to travel through time. Zoom wants to harness the power for his own purposes, and our heroes are in the way of his plans. Professor Zoom's attacking cyclone is stopped by Superman's negating counter force. However, Green Lantern is too late to stop the speeding villain from disappearing into the time stream. Unfortunately, Rip Hunter cannot worry about Professor Zoom right now. Chronal feedback from another source is wreaking havoc. Will it also prevent the Time Masters from completing their mission to find Bruce Wayne? Black Beetle, the source of the temporal rifts Rip has been following after Professor Zoom's escape, is about to graft the remains of Waverider onto himself when Supernova confronts him. While the villain is occupied, Liri Lee grabs his objective. Joining with Waverider has made her a new, and possibly more powerful, Linear Woman. The Beetle, in the meantime, is very close to killing Supernova when Superman and the rest of the Time Masters arrive. The Black Beetle makes his getaway, making certain Rip Hunter cannot follow him thanks to cloaking technology. The battle with the Black Beetle is over, but the adventure is only beginning for the Time Masters. The Time Masters have encountered the new Linear Woman. She refuses to comply to Rip Hunter's rigid rules of time travel, and, as a result of their verbal confrontation, Linear Woman and Matthew Ryder disappear together. What happens next with the Linear Men will have to wait for another day. The Time Masters must find Bruce Wayne. With Vanishing Point destroyed, Rip must work together with Supernova to transport the team to one of its satellite outposts. There, they can witness Bruce Wayne's adventure through the ages. Unfortunately, they can only watch the events. Darkseid's Omega Energy prevents them from traveling to Wayne's locations. However, Batman's voyage will eventually bring him to Vanishing Point. All Rip has to do is put a version from the past where the other was. Can he succeed in bringing Bruce Wayne back, or will he be lost in the ages forever? Superman, Green Lantern and Booster Gold are in stasis as Rip and Supernova discuss their plans. Supernova reveals himself to be an older version of Booster Gold. He and Rip's mother work together with their son to bring Vanishing Point back. They succeed in doing so. Bruce Wayne can arrive without problems. In spite of being overloaded with enough radiation from the Omega Energy to cause time itself to break up, Batman returns with the aid of Superman and Wonder Woman. The Time Masters' mission was a success. But for Rip Hunter, Booster Gold and Booster's sister Michelle, the adventures in time continue. On Rip's blackboard in his Arizona laboratory, there are things that Hunter had never even written on it. It is a mystery that could disrupt all in the space/time continuum forever. Story - 3: On one hand, it's better than previous chapters of the story. On the other, the series as a whole was a slow, muddled mess that weighed down the positive aspects of this issue. Time Masters: Vanishing Point would have worked better as a two or three issue arc instead of six. Too many things go on at once with too many characters and situations that, like the tie-in to The Return of Bruce Wayne, feel unnecessary. I did like seeing the Linear Men and Waverider, but they could have been placed into the comic without involving the search for Batman. That plot element is nothing more than a sales ploy. While I like Professor Zoom, I can't help but wonder if his presence is merely meant to kill time. Sure he wanted Omega Energy, but it seems like Zoom pretty much was put into the story to make it longer. Hopefully, his purposes will be revealed in other DC books. Otherwise, we've been given a huge red herring. The ending feels like it was rushed and added at the last minute. One would think the whole mini-series would have been planned better start to finish. Overall, it has its moments, but, quite frankly, I expected more from the final product. If I want a good Dan Jurgens story, I'll stick with his classic runs on Superman and Thor. Art - 4: Unfortunately once again, nothing much stands out, and the art merely aids in telling the story. In spite of that, it's well done. Cover Art - 5: Like the previous chapter, this one gives us a cover image that makes the viewer curious about its contents. It's a shame the rest of the series wasn't as good.